Hip-hop pioneers like Salt-N-Pepa and Rakim inspired MC Lyte to partake in the music in-dustry at such an early age. MC Lyte also vividly remembered how the Bronx-born, hip-hop group Grandmaster Flash and the Furious Five helped to shape her storytelling rap style. 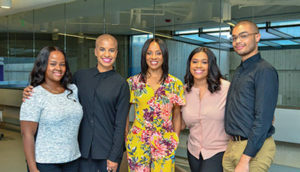 MC Lyte said that young artists, who are pursuing careers in the entertainment business, should educate them-selves about royalties, build a trustworthy team and seek legal advice when necessary.